I've started the design work on my next creation which will be a bit different than the last few I've built. This robot will be a Hexapod based on a circular body. Each leg will have 3 drive motors and will use a design similar to the old Odex I (look it up if the name isn't familiar!). All moving parts will be on bearings or bushings, there will be 24 per leg. 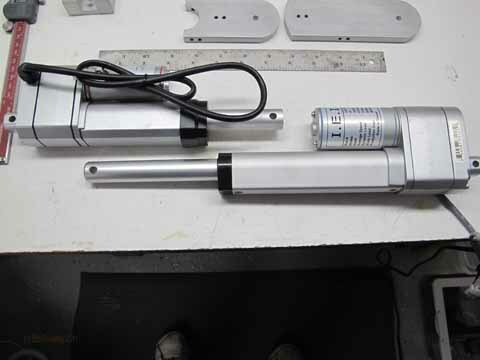 Linear actuators drive two axis and the third uses a large gear motor. 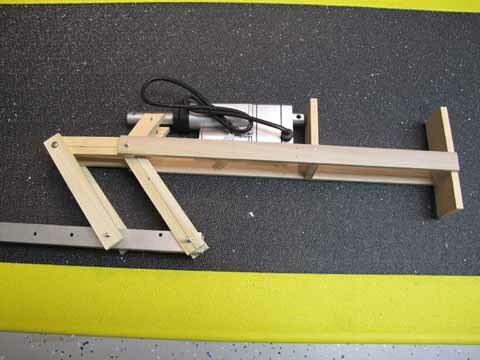 I built a wooden version of one leg to validate the design,clearances and interferences. 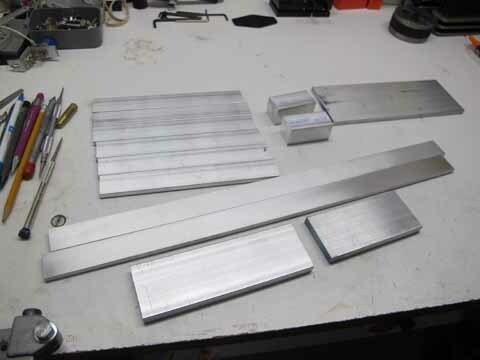 The CAD drawings were finished last night so the next step is cutting out the aluminum stock. 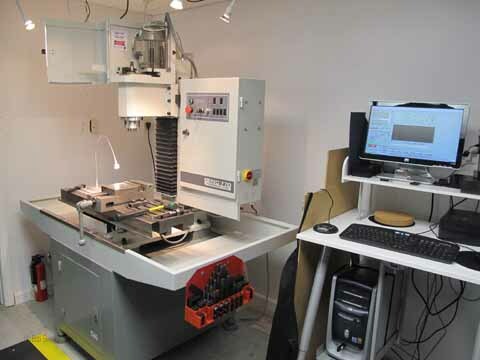 Then it all goes into a CNC mill to make the parts! I'm using Parallax parts as much as possible but some things like the linear actuators were ordered elsewhere. The HB-25 motor controllersl are used to drive the 12 volt motors and 6 custom propellor boards will be used to control the legs. These controllers will be networked together with a master prop board running the show. The goal is to get the mechanical parts for a single leg together before the end of the year and have the basic individual leg programming completed before spring. I expect the final weight of the robot to be around 125 pounds and it will stand up to a maximum of around 4.5 ft. The rest of the legs will follow shortly after that (nice thing about a CNC is that design changes are easy to incorporate and reproduce!). I plan on using Rodney Brooks's behavioral programming ideas for this robot. So I have a lot of studying to do. My big goal is for it to be able to climb stairs with a minimum of input from myself. If I can do that, then it will be a success for me! I'll add photos as I go along if anyone is interested. Sounds very interesting! Can't way to see this progress! I'm interested in the progression of your project, DiverBob. The whole description is interesting. Share as much as you can, as you proceed. Fantastic, DiverBob! I was a huge fan of Odex 1 back in the day and yours is a huge and noble effort. Def keep us in the loop on this major undertaking. My own efforts are much smaller these days: I'm still messing with OBC's simple "one servo robot" challenge. Gotta do something useful with the dozens of dollar Chinese relays I've been accumulating. Not hoarding, Ken. There's a subtle difference! If I remember correctly I think I talked to you about your first hexapod robot at the second UPENE show. Sounds like your new project is going to be cool and I'd enjoy seeing pictures of your progress. Are you going to put a dome on the head like the ODEX robots? I have sources for those if you need some. Almost done with the CAD drawings, will convert them to G code for the CNC mill (I have a Tormach 770 for those that are interested). Most of the hardware will be custom built for this project. I am taking vacation all next week so I should be able to get a lot done. 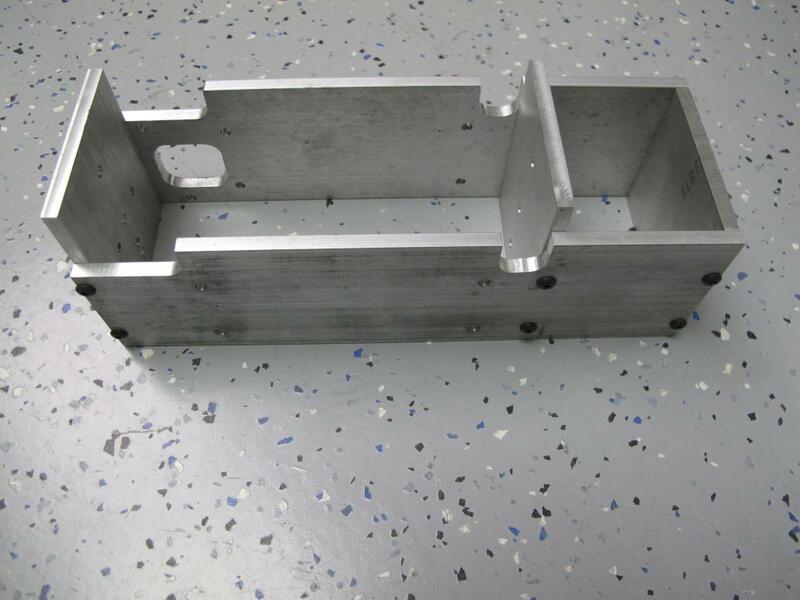 I'm also investigating aluminum anodizing, that would give the whole project a very nice look! I was inspired several years ago when I subscribed to Robotics Age magazine when a 1984 edition featured the Odex I. It was far and away more complex than anything I had attempted up to that point but I knew I had to try. The learning curve was steep and the price even steeper, but I finished a basic version back in the early 90's. Unfortunately it wasn't a complete success (it ran but only under full human control, the controllers I built and the available software wasn't up to the task -also all my money was going into this one project for several years!) due to a number of issues both mechanical and electronic. I blew my budget on it but it got me interested in metal machining and mechanical engineering. The propellor expo got my interest in robots going again when I saw the progress others had made and how far the level of controls have come. I believe my new design will overcome most of my earlier issues and computer control has come a long way! I'm using the propellor chip as the controller, it's put the 'fun' back into programming for me. 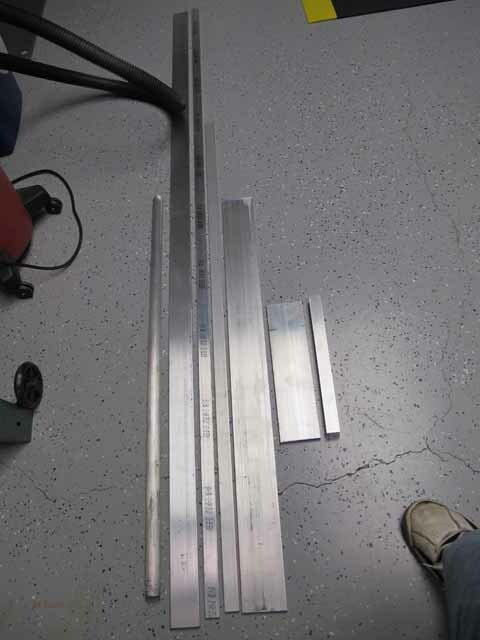 Raw material (Aluminum) for one leg is cut to size, (used 81 inches of 1 x .25 stock, 8 in of 3 x .25, 12 in of 2 x .375, 4 in of 1 x 1) started validating the G code for each piece and optimizing the cutting sequences. This is important because if all works out OK in testing then I have 5 more legs to produce! Initial test cut ended up breaking 2 end mills, going back and verifying the cutting speeds and feeds are correct for type 6061 aluminum. I remember you were talking about doing this at the UPENE. It will be fun to follow your progress. I think it would be neat to see the milling work as well as the construction. Have fun! PS what was the name of the spider in the "Lord of the Rings" that bit Frodo? I told my wife that your Hexapod was the motivating factor last summer to get back into Hexapods again! I won't introduce you to her at the next expo, there could be trouble! 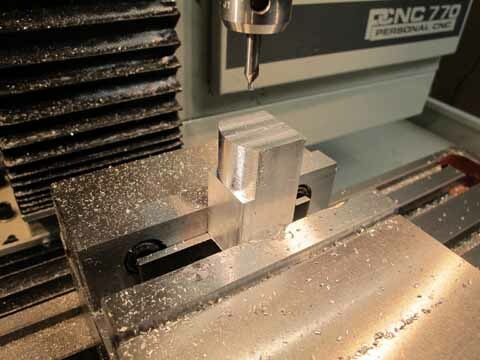 I'll try to run some videos from my iPhone during machining. I'm heading back down to the man cave to run the next tests go the G code. I spent a lot of time last night updating the CAM info, now to see if it pays off. The spiders name was , I had to look it up in the book. That might be a good name for a large Hexapod? I started a blob in this forum to put in more details of the build, kind of a diary. Let me know what kind of information you would like to see. 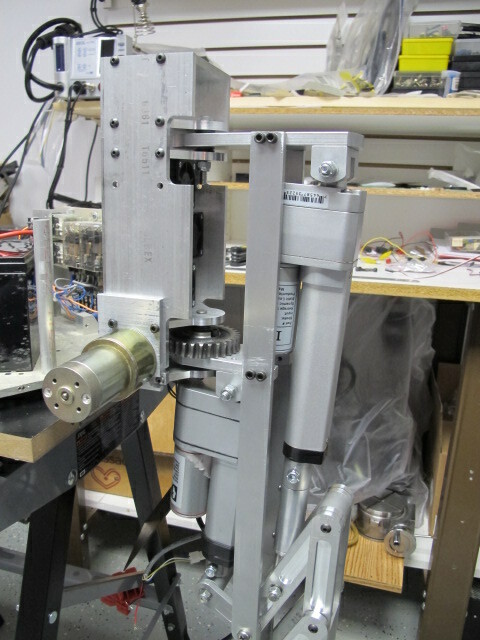 The last two days have been filled with milling out the various pieces for the robot. 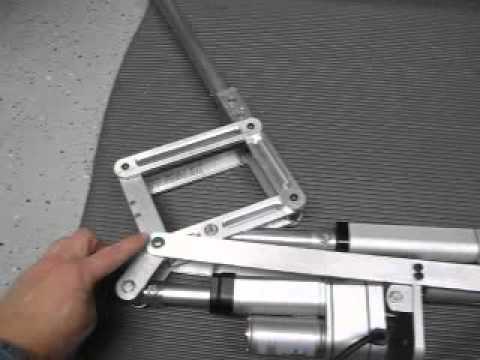 The main leg supports are complete along with various connecting parts for the leg kick and lift system. I finished building the first motor mount tonight. 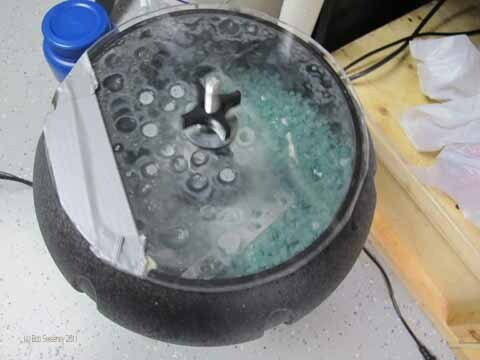 Parts are being deburred and then put in a vibratory bowl to remove machining marks. Eventually I want to anodize the parts, the hard anodize layer will reduce the number of nicks and scratches and generally give the end product a more professional look. Here are some photos that I took of the process. The photos show the raw stock on the floor prior to cutting and then the cut material. The next photo is my original leg design followed by a full scale wood prototype leg. The motor mount is being machined in the mill and the last photo is polishing the parts after milling. You're diving right in, nice! Would like to see some photo details of your motors & leadscrews. Great project, DiverBob! Thanks for the update. I think it's neat to see how everything is created. If its any consolation for your wife, you've inspired me that I really "need" a CNC. Someday.... Have fun and did you see that Speedy Metal is having 10% off this Friday-Sunday and 15% off next Monday? Busy days but productive! The photo below shows most of the major parts that go into a single leg (with a few exceptions that are still being polished). The top round piece is the part of the foot of the leg that touches the floor. The next 2 are the main leg supports, just above the ruler at the bottom of the photo are the upper and lower swivel attachments. These screw into the holes on the right and middle of the main leg supports. 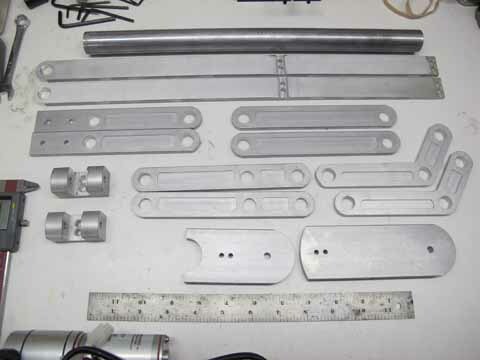 The 2 3D parts are the motor mounts that also attach to the upper and lower swivels. Right under the main supports on the left are 2 parts that are part of the pantograph, actually all the remaining parts are part of the pantograph. The two parts on the left side under the main supports are the upper portion of the leg foot assembly (missing from the photo is the part that connects the foot and these parts together. 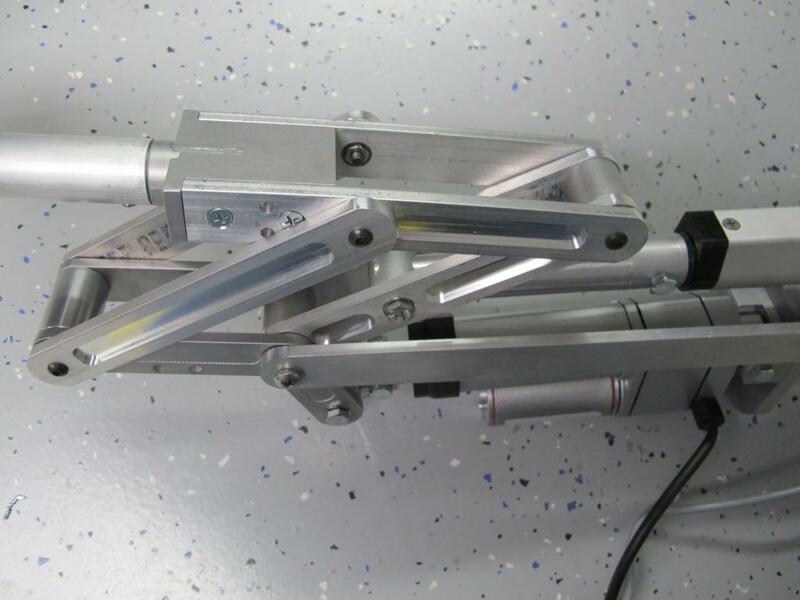 The curved parts on the right side are part of the kick arm assembly, this uses a motor to allow the foot to 'kick' out. The large holes in the parts are where all the bearings and bushings go. 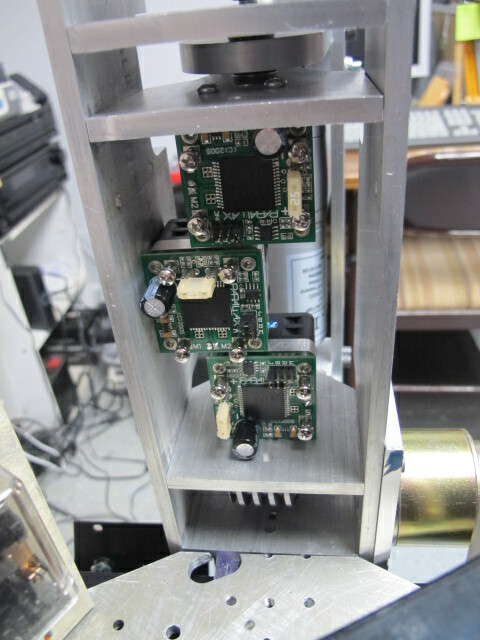 Here are photos of 2 of the linear motors being used. One has a 2" throw and the other is a 4" throw. Both are capable of moving 110 lbs and holding 550 lbs. All this and only 12v and less than 10 amps! They have integral internal limit switches and output potentiometers. I have both pistons fully extended in the photo. The piston moves .5" per second. Next steps are to finish making several smaller parts that connect everything together. Even the lathe got a workout tonight making connectors! Then I'll be heating all the parts to around 250-300 degrees and then press fitting the bearings. Once the bearings are installed then I can do an initial assembly and see if everything fits together the same way they did on paper! In other words, this is when I find any math mistakes I made in the calculations! I did an initial test fitting of the parts and most everything is going together as expected. I have several notations on the plans for changes to the design but this test leg looks like it will go together well enough to start installing the motors and electronics. I need several sizes of fasteners that I thought I had but didn't so I'm putting together a list of items to order in the next few days. I can make due with some of the fasteners I have just for testing but I want a uniform look to the project. I'll get some pictures posted of the assembly process later. Have you considered how your sensor array will interface and where the sensors will be located? If you are looking for it to go up and down steps then I would suggest using a combination of several differnt devices for sensing. For example a dual or tri axis accelerometer to keep it level, sonar and IR for object avoidance, bump sensors just in case something goes horribly wrong, a gyro for additional balance or leveling, perhaps even one of the laser range finders. Also if you want to get fancy you could run wireless transmittors and recievers to send and get information, location, new instructions or even dump onboard memory (or use thumb stick memory) and overlay a GPS so you can create maps. If you really want to do it big, get a CMU cam and use the color detection to have it locate and follow or track an object, give it a RFID to gain access to doors properly equiped and an onboard charger so it will find an outlet and plug itself in when it needs to recharge and give it PINK capacity so it can communicate via the web to a remote terminal. Sensors for the project are planned but I haven't really gotten into figuring out everything I need/want. It will probably be a gradual process instead of adding various sensors as the need for them arises. One advantage of a large Hexapod is there is plenty of space for installing sensors, weight is not a serious concern (the motors I have can move about 330 lbs) and the batteries will be fairly large. 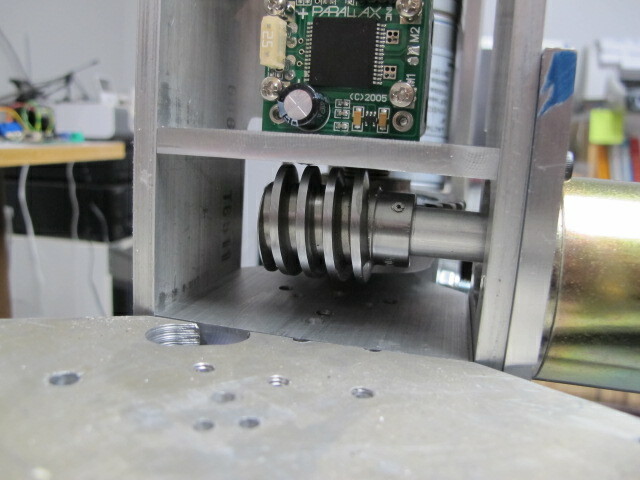 The initial sensors will be to determine leg position and identify when the leg is on a surface that will hold its weight. The next layer set sensors will be 'bump' sensors on each leg so it knows when a swinging leg encounters an object. Since I plan on following Rodney Brooks behavioral programming as a guide, I should be able to layer in new sensors that will automatically interact with other sensors in unique ways. Of course, ~10 amps times 12 or 18 linear actuators can add up pretty quickly... what's your planned power source, maybe a liFePO4 scooter battery? I may go with a bit smaller size battery this time; I am using a 12v 15amp-hr gell cell for initial testing right now. Once I get some better values for current draw from the test leg then I can figure out what size battery(s) I want to use that give an acceptable run-time. 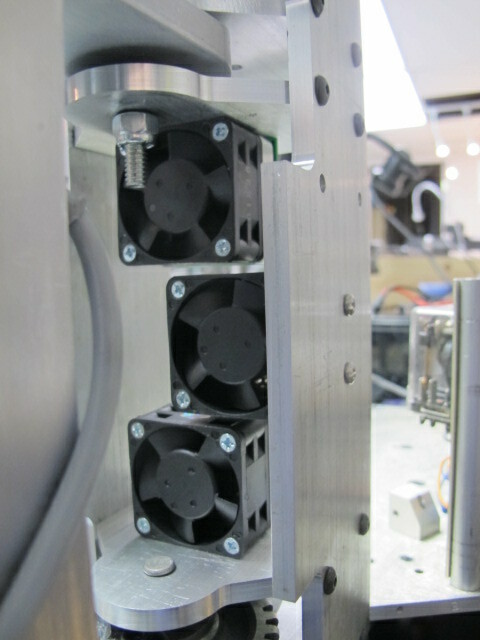 Although the actuators can use a lot of juice, most of the time they aren't going to be powered or under a high load, and the design helps minimize the time that high power is required. It was a good day, machined 6 new pieces with improvements incorporated. I will redo the kick arms tomorrow, that pretty much uses up the aluminum on hand, I had to scrounge for a couple of scraps that I could use also. I decided not to use bushings in this design so I will need to order additional bearings when I make the remaining legs, I have enough for testing this leg. I have to change the way I mount the motor blocks, the screws are too close together so the heads on the screws are interfering with the ability of the motor to swing freely. Tomorrow I plan on finishing mounting the linear actuators so this will the first time I can test the leg movement electrically. Sounds good Bob! Maybe after you get those legs tested, you can post a little video or something too. I got alot done today. I didn't have all the specific 1/4" fasteners I want to use so I had to make a quick run down to the hardware store for some standard bolts until I can put in an order to McMaster Carr for more parts. I got both linear actuators connected up and running. I attached a short video that shows the leg movements. I'm just connecting the actuators directly to the battery for now. I need to finish up the body pivot boxes (shown in the video) which is where 3 Parallax HB-25s will be mounted along with the Propeller controller (once I design and build the circuit boards!). The leg is very sturdy with very little slop in its movement. I still need to re-do the kick arms with the new design but the version in the video works OK for this stage of testing. I can't wait to get the swing motor configuration figured out so I can start programming this beast. I know I'm going to be looking for some help with a couple of algorithms such as how to move the leg tip in a straight line while the swing motor and kick motor are running. Edit: I must be doing something wrong, the video doesn't want to upload, I've been trying for an hour and no luck so far. I'll try again tomorrow. I'm still having problems uploading a short video. The original video was too big, and the new one is much smaller but it doesn't want to cooperate. At least I have some new photos of the leg assembled. I'm quite pleased that the leg is pretty close to what I planned and the mechanical motions are very smooth. I have a basic design put together for the swing motor enclosure that I have finished the CAD drawings for and will start milling that out tomorrow. Once that is completed then I can mount the motor controllers and start seeing about running this with the propeller board. I'll keep trying to get a video posted! Bob, I have found the YouTube is the best way to share video. Upload there, then post the "share" link. Also the details in you machining look fantastic! Thanks for the suggestion! I started to think about other options last night and YouTube was one of them. Anyway, I was able to successfully upload a short demonstration video of the leg in action. Since I haven't created the swing motor assembly (hopefully today!) its laying on the floor during the test. Many of the parts on the leg are newly machined (the bright shiny ones) and haven't been put through the tumbler yet. The dull gray parts are ones that have gone through the initial polishing stage. This video should give people a good idea of the range of motion the leg is capable of handling. The leg can move vertically about 11 inches so depending on the position of the other legs this can be a 22 inch reach for stepping up or down. It should be able to handle the stairs mechanically, programming that part will be an adventure! Bob that is completely awesome! Most excellent to see in action! Thank you for sharing! Today turned out to be very productive. I finished machining the swing motor assembly which includes the pivots for the leg. 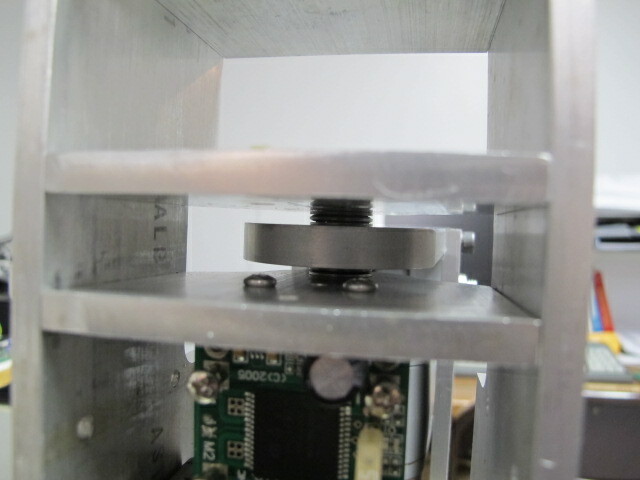 The photo below is the basic swing motor assembly that I started with. This was taken from a previous robot since the setup for the new leg is very similar. The next photo is the assembly with the leg mounted and the whole contraption hooked up to the basic hexapod body. Right now the leg is only connected to the body from the bottom so I can't put too much pressure on when I try to lower the leg tip. The motor sticking out is the swing motor and it is connected to a worm gear that swings the leg. The next photo shows a backside view of the worm connection. I'm not a big fan of using a worm gear here because the speed the leg can move from one extreme to the other isn't as fast as I would like. I am going to look into some spur gears but then I might have an issue with motor torque not being enough. One other possibility is using large stepper motors with spur gears. This would have the locking advantage that worm gears have but the disadvantage is the power consumed by the size steppers I would need. I'll just have to experiment with each option and see what works out best. Since I didn't want to wait, I went ahead with the worm gear for now. Next part was creating the assembly pivot points and adding thrust bearings. 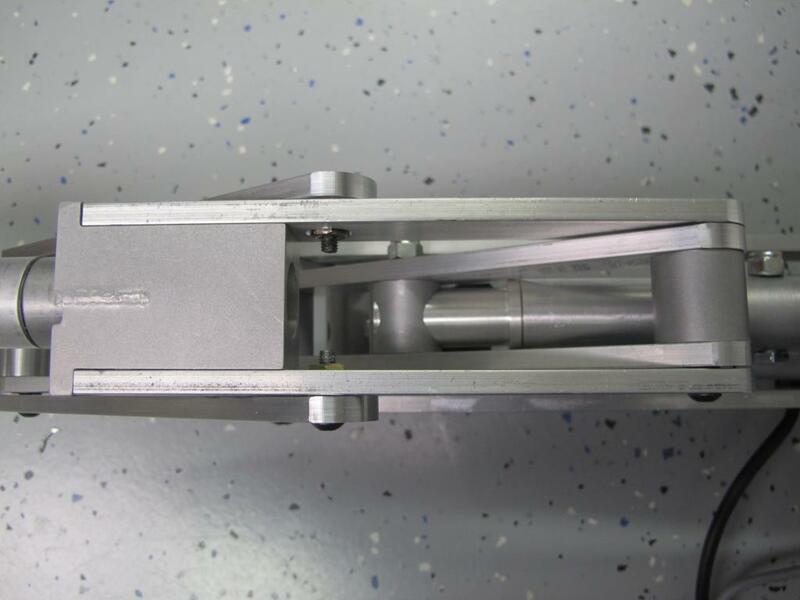 There are roller thrust bearings above and below the leg pivot which is the center curved piece of metal. The lower pivot only has a thrust bearing on the top of the pivot right now, I have to create some custom spacers because there wasn't anywhere to drill new holes to mount the bottom assembly box pivots where I wanted them (that's what can happen if you re-use old materials). For now this setup works for testing, I'll update the CAD files to reflect the final setup later when I can afford some more metal stock. These next photos should look familiar, here I've mounted 3 Parallax HB-25 motor controllers in the space between the pivot points on the swing motor assembly. I also want to mount the controller board in this space but it is getting a little crowded in there now! 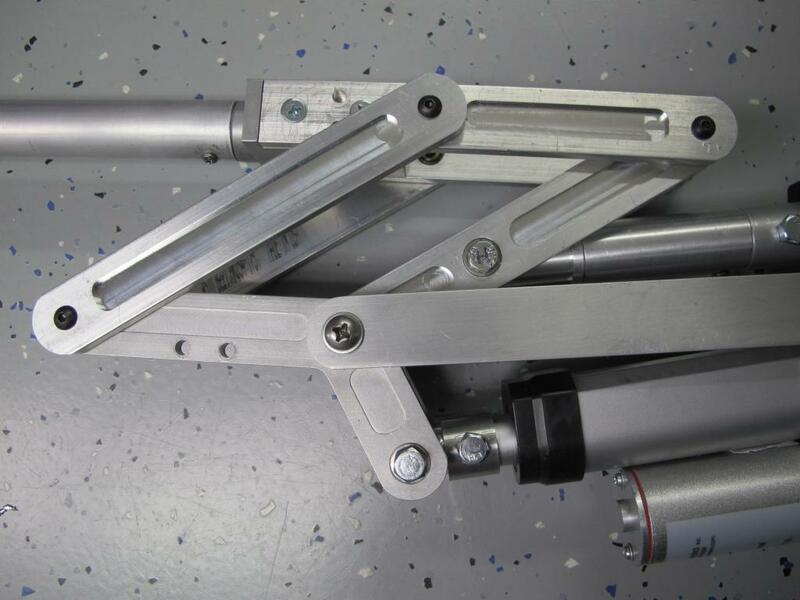 Because the linear actuators have a potentiometer built in to the actuator there is no need for a position encoder for the lift or kick motions. I still need a means to monitor the swing motor so this is one place I may use the Parallax position encoder. I believe I will mount it on the worm shaft and see how that works out. Unfortunately the little plastic vanes that come with the Position Encoder doesn't have a means of positively locking the vanes in place so I'll either sandwich it between some nuts or make my own. I also want to put in some hard limit switches on the swing motion so a runaway motor doesn't start breaking things. The basic machining is completed now. I have a couple of additional changes to make since the kick motor mounting block is interfering with the ability to swing the leg a full 180 degrees. Right now it only swings about 110 degrees which would limit the stride length and walking speed. There aren't any other major changes that I can see so far. The leg has turned out to be better than expected in looks and mechanical performance. I'll be wiring up the power system next and getting the Propeller programming started soon! I've moved everything down to the other end of my workshop to my programming station. 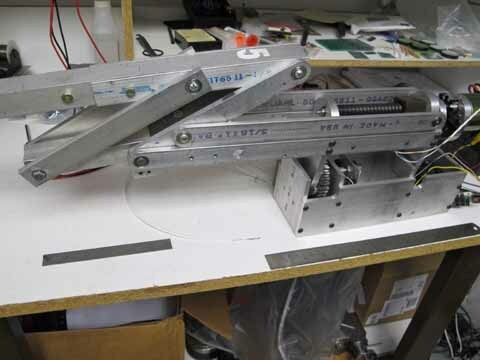 The robot body is clamped to a portable workbench that will allow the leg to have complete freedom of movement for testing. I'll report back soon as I get the power system wired and can run the motors through the motor controllers. I'll try to get some video put together once I can run it from the prop board. Amazing. This is so cool! Thanks for making the video, it's a lot of fun to see the leg moving. Thank you for taking the time to document this. It will be fun to see this come together. The motors are wired into the HB-25 motor controllers with a 12v gell cell providing temporary motor power. I wrote a couple of simple propellor programs to test the legs and it's working! The swing motor doesn't have enough torque to move the leg well so that is one area I'll have to address sooner than I hoped. I have a small collection of surplus DC motors I'll have to try some of the others and see if any of the others would work. If anyone knows of a good source for hi torque 12 v motors, I'm very interested! The next programming tests will be to program some push buttons that will allow me to manually control the leg. Then I need to get an ADC going for the linear actuators so the actual position is available. I may try the ADC using a prop pin with a resistor and cap to see how well that works, the other choice is the dedicated 8 channel ADC chip. Either solution should work, will have to play with both options. Now that I know how to do videos I'll post the program tests next.